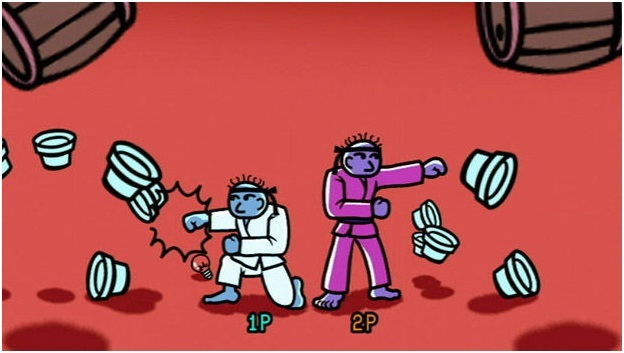 Rhythm Heaven Fever (a.k.a. Beat the Beat: Rhythm Paradise, Everybody’s Rhythm Heaven) is the third game in the Rhythm Heavenseries. The previous installment, Rhythm Heaven, released on the Nintendo DS and the rare first installment, Rhythm Tengoku, never got a U.S. release on the Game Boy Advance. Rhythm Heaven Fever has a noticeably easier difficulty than Rhythm Heavenwhere players tapped and flicked. In this fast paced music festival, quick reflexes and shape adaptation skills reign supreme amid a simple control system where players only use the A button or A and B buttons together. The unlockable two player mode is a welcome games series addition. In Rhythm Heaven, you play to the beat to gain “flow” and medals, which opens more musically staged mini-games. That’s your simple goal in this single player game, which has international appeal among several challenges pushing player touch and timing skills. The biggest challenge comes in the timing (for a high challenge where players can complete each stage without the beginning practice tutorial for an even higher challenge. Learning on the fly can be adventurous or disastrous, but thanks to great level design, intuitive gameplay, and simple controls, it is definitely adventurous here. Over 50 music related games feature original compositions from Japanese singer/producer Tsunku. There are several entertaining levels while others provide more challenge. As in the Nintendo DS version, these varied levels are seamlessly woven into a comprehensive level at the end of a group. It’s a great addition to reward your work and galvanize these memorable musical stages in your head. The visual styles match the strong music as players progress through the replayable stages in a simple grid reference format. The controls begins with the A button only and a couple tests where players must excel at maintaining rhythm. Performance results in an award medal, OK rating or no pass, which requires a redo. As players graduate to the A + B button controls, the graphic menu expands and progression works from the bottom to the top. Use the + button to pause any time. The main “flow” level column sits in the middle; medals on right; and bonuses on left. Players are also encouraged to take a break in the Café, which has browsable content including music, reading materials and rhythm tests. Other bonuses include rhythm toys, and other fun unlockables. The unlockable rhythm toys include a toy car where players pull back at the right moment so the car stops on the right spot (ghost visuals are a great help here). Other rhythm toys include the police call, hi-hat, and rhythm fighter. Players can practice before each level except the comprehensive “remix” levels, which act as a boss type levels signalling a set ending. Along with the music, the sound cues and character motions help player match the actions. For example, the first outing feature golf with golfing with a monkey and a mandrill. 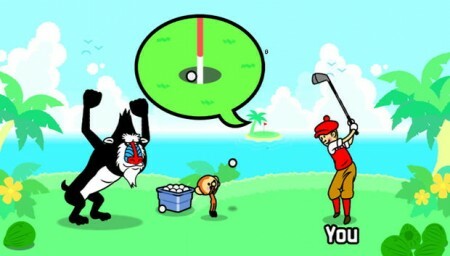 Players can can continuously swing as they try for a hole in one on the far away island as multiple tries help at the beginning. A common hint for success here and other levels is to watch the arch and hit objects on the way down. After you get the monkey’s rhythm down, then look for the mandrill’s straight toss and subsequent yell prompting players to swing. Both primates also provide a corresponding reaction based on player performance. The cues become familiar in future levels where players can quickly identify bystanders or helper characters that lend a hand. Other beginning levels include the “screwbot factory” complete with a nice black & white design with a “quality report” grade at the end. Next levels involve players mimicking a primate with a tambourine then a see saw level where jumper on the inner board always go faster. The double date levels features fun with football, basketball, and soccer as gophers react to player performance. Players can also enjoy watching where each ball ends up in the background though this distracting delight is better suited for game viewers. Levels progress to a wrestler answering interview questions from a young woman, forking fast-moving food and a dog playing badminton in an airplane with a cat. Other average levels like Love Rap! are still solid, but not as intuitive or appealing as other levels. It does not take long to unlock the two player mode where both players can finally work together for the first time in the series. The two player mode features eight games. Other special surprises and bonuses make this a delightful experience as players can try for higher scores after initial attempts. Rhythm Heaven is an easy pick-up-and-play title without a storyline or characters, though the playable characters are very memorable. This entry was posted in Video Game Reviews and tagged Games, Michael Siebenaler, Mike Siebenaler, Rhythm Heaven, Rhythm Heaven Fever, Tall Writer, video games. Bookmark the permalink.